There are many questionable elements about the thoroughbred racing industry. Let's please set them aside for a moment, to talk about unquestionably the best horse to come along in many years - maybe ever - Zenyatta. I've been following this astounding race mare since her career started - at the age of four - because her trainer, John Shireffs, realized she was not ready to race as a three year old (or god forbid at two!). Just the first of many wise decisions made for her by her connections. Zenyatta is undefeated in nineteen races, and should she win on Saturday in the Breeder's Cup Classic (again) she'll be the winning-est tb in history. Where to start... she's a huge, gorgeous mare, bursting with dapples and personality. She has become famous for the Spanish walk she does in the post parade and on the way to the gate. She laps Guinness Stout out of tupperware containers like a dog, loves her beauty sleep and is reportedly super kind to handle. Her connections are in awe of her - you can tell. Zenyatta's racing style is what really sets her apart. She's a closer whose thrilling late in the race, come from behind charges could induce heart failure. She seems to know exactly how much effort she needs to put forth to win. John Shirreffs believes this is the key to her longevity and soundness. Mike Smith, her jockey for all but three of her races, believes he has not gotten to the bottom of her yet. All I know is when she starts to go, the horses she passes look like toys. Her stride is that huge. And she's so relaxed that her ears just flop back and forth as she crosses the finish line and gallops out. John Shirrefs has been generous enough to post frequent video of her over the course of her career. One of my favorites is this one where you can take a ride with her on one of her morning gallops. Not to be missed. 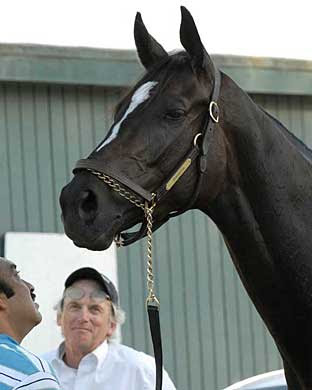 It was (prematurely) announced that Zenyatta would be retiring after her Breeder's Cup victory last year. Thankfully, her connections decided to race her for one more season. 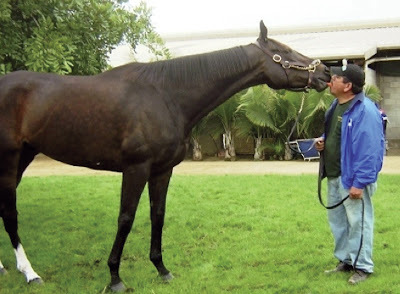 The owners, Jerry and Anne Moss, have more money than God, so I believe them that their decision was in her best interests - plainly she loves what she does - as well as the best interests of horse racing in general, which needs more stories like Zenyatta's. I love how she does it - nice and easy loping along in the back until it's time to do something - Secretariat used to do this in many of his races. She is one amazing and special horse. I love how she comes from behind, she really does make it exciting. I hope she wins this Saturday. The ride along was fun too. Great video. I love love love this mare. Every time I've seen her race I can't stop smiling, my chest tightens with that awe and joy that can induce tears if not held in check. She is incredible, and she obviously loves what she does. I watched the helmet-cam workout video awhile ago and it brought back memories of my TB mare, Star, and just letting her GO! Amazing horses our Thoroughbreds are. Oh thasnks so much for this wonderful post of a LION hearted mare!! I just bawled, as she began to run, in the training video! John S. IS AWESOME to allow us to ride with him like that! She makes me want to be brave enough to let Val go out on the beach and grab mane! I just love John Shirreffs. I heard an interview where he talked about how incredibly fortunate he feels to be Zenyatta's trainer... and how he doesn't dwell on the future, but stays in the moment to savor his time with her. In the arena #37 - A girl can dream can't she?! In the Arena #36 - Halt. Angle. Flow.